From Here to Greater Happiness OR How to Change Your Life – For Good! Starting with the first session, the Teutsch IDEAL Method provides instant high-precision insight and direction which produce excellent results for people from every age group and field of endeavor. No other methodology can make such a claim. 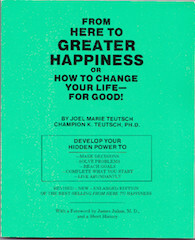 This book has permanently changed for good the lives of hundreds of thousands of grateful readers all over the world. It can do the same for you, your family, your friends and acquaintances. Besides, it started the Consciousness Revolution, Assertiveness Training, Behavior Mod, Holistic Medicine and the Human Potentials Movement and of course the Teutsch IDEAL (individualized-directive-explanatory-action-log) Method. Study the 14 steps that have propelled thousands of grateful readers to maximum achievement. Crack through the genetic barrier erected by your well-meaning but ignorant ancestors. Use the incredible force of Dr. Teutsch’s proprietary B.I.D. (basic inner desire) to reach and surpass your goals and launch yourself and your children into an unprecedented success orbit. Praised by enthusiastic readers in the U.S.A., Japan, South America, Holland and Russia as the book that opened their eyes to their true potential. Become a new you in 162-action-packed pages, chuck-full with simple and clear illustrations. Learn why presidential assassinations are predictable and therefore preventable. Understand why government officials, business leaders and university professors secretly use this book as reference. See for yourself why Kaiser Permanente ordered 500 copies from the first printing of this volume. Discover why this book was repressed by the Human Factors people at Ramo Wooldridge Laboratories, Canoga Park, California and by envious ministers. A physician called this the most stolen book from his waiting room! Available in English, Spanish and Japanese. To obtain your copy click on the link below.